Sunday 1st January 1978 saw the boys who do Nuffin' appear on national television. The London Weekend Television production of The Year Of Punk presented by Janet Street-Porter was aired and featured the stars of 1977. From the Pistols, Clash, Damned, Eater along with the Bears Clutch Plates and Nuffin' to name but a few, the documentary reflected on a year that changed popular music for ever. It was pure good fortune that our gig at the Roxy, Neal Street London WC2, the Mecca of Punk Rock, was filmed as part of this production. Our set along with an interview was filmed and then edited down to 60 seconds of pure Nuffin' gold and it nailed our place in history as a contributor to the 'punk movement' of 1977. To commemorate this TV event we have placed the legendary footage on our new YouTube channel. Please check it out via the link below and subscribe if you like what you see. We have added some footage from some of our recent gigs as well. 40 years on and Nuffin' are more active than ever with a string of gigs under our belt and a few more lined up for the coming year. The long awaited debut album will be released this year. More details will be announced nearer the time of release. 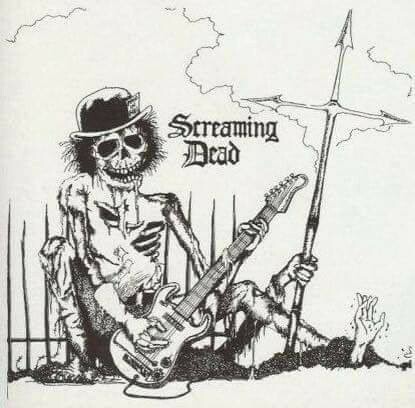 Screaming Dead are a horror-punk band formed in Cheltenham in the late 1970s. They reformed in 2013 with three of the original members and have played gigs all around the world. Please message the band for info relating to booking gigs or merchandise. The power Punk Rockers that are the Plague UK. In 1976 Punk band The Plague, known to have played the Roxy Club more times than any other, released a single in 78 called 'In Love' which charted and was played on Radio. The band disbanded back in 1981, and they decided to reform in 2005, and in 2015 put out an album called 'What Do You Expect' but again the band went their separate ways in 2016. Well, now its time to unleash this monster with the band having a new name, new band members, except the original creator and front man Marc Jefferies. We are ready to power on through 2018 to spread the sound and energy of the all new Plague, Plague UK.